His outfits were the cutest! Wrapped in a stars and stripes-printed baby carrier, the 3-month-old sat with his mom, Nicole Johnson, for the event and was decked out from head to toe in some very patriotic gear. Boomer even topped the whole look with a pair of red, white, and blue noise-canceling headphones, just to show his dedication to safety. "He's going to have some cool outfits on, that's for sure. You've got to check him out," Phelps told Us Weekly last week. "I've gotten some photos of him — Boomer will be dressed to impress in the stands, that's for sure." For an idea of what's to come, here are just a few of Boomer's best looks. As promised by his father, Boomer has continued his adorably patriotic streak of outfit choices at the Olympics, wearing a red, white, and blue-striped outfit to watch his dad win the 200-meter butterfly. He also topped off the look with a pair of stars and stripes-patterned headphones, because, as previously mentioned, he's all about safety first. 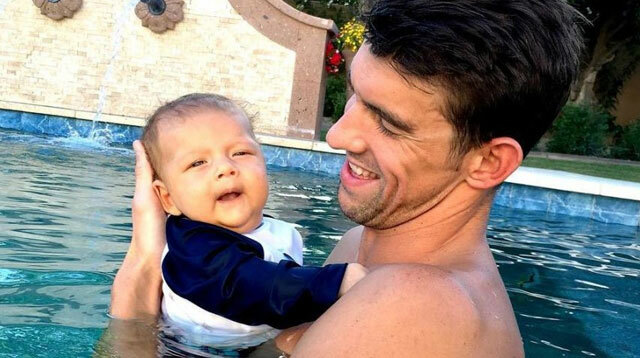 After his dad secured the gold, the two also shared a super-sweet moment when Phelps gave his son a kiss in the stands.